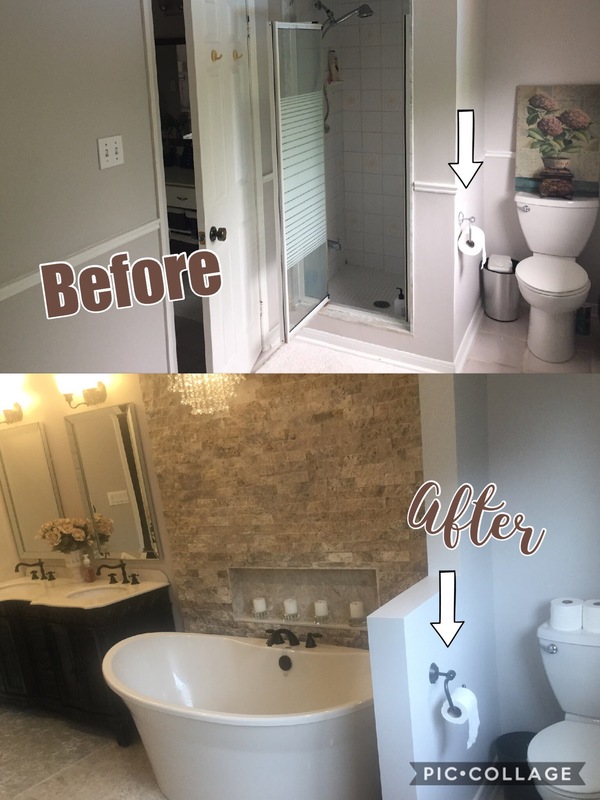 Bathroom is done! | ARTZCOOL'S BLOG! 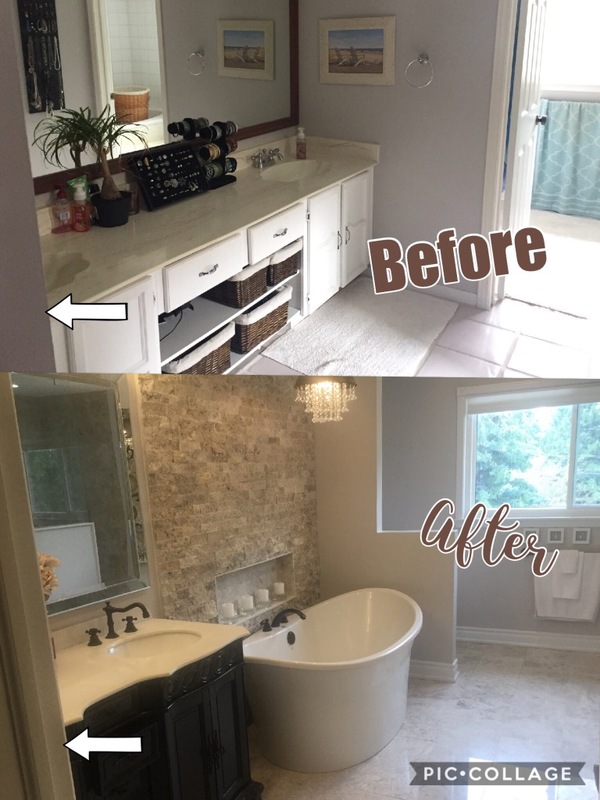 I have had a few people asking to see pictures of our finished renovation that we did this summer… sorry for the delay, but I’m finally getting around to it. 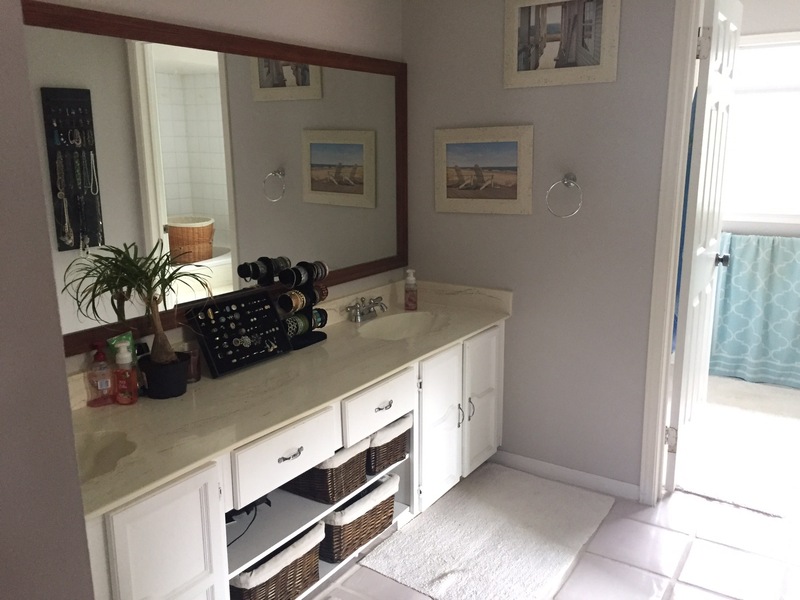 Here is our lovely vanity, complete with the lovely cultured marble countertop with scalloped sinks. 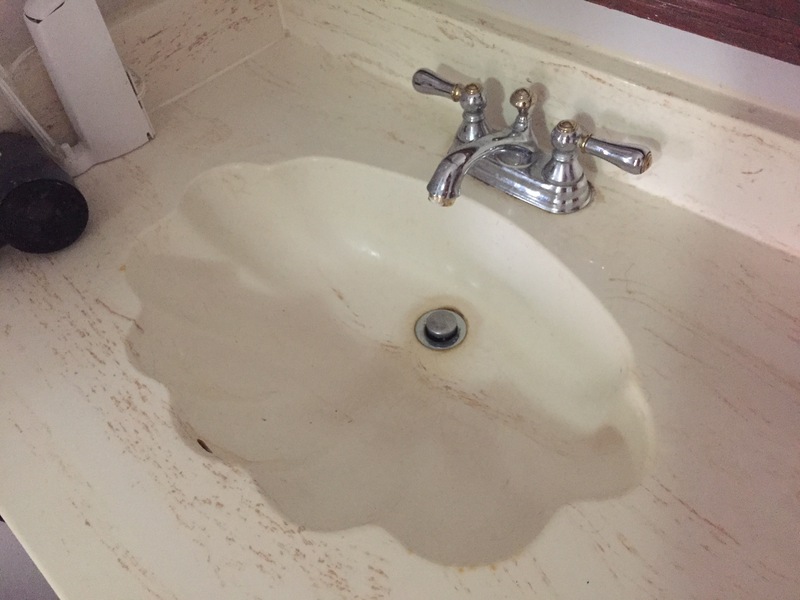 We had a total of five of these sinks in our house when we moved in. These are the last remaining two! 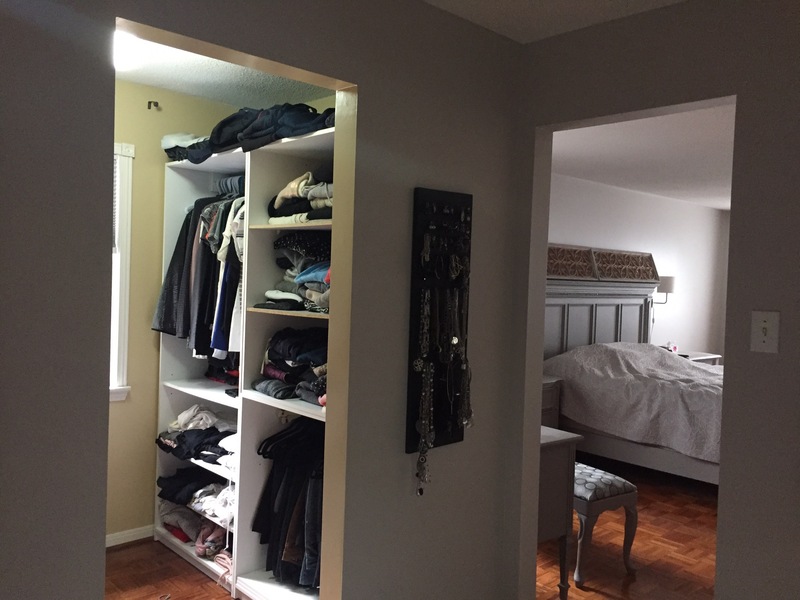 The entrance to our closet opened up into the washroom. Here is a closer view of the floor. 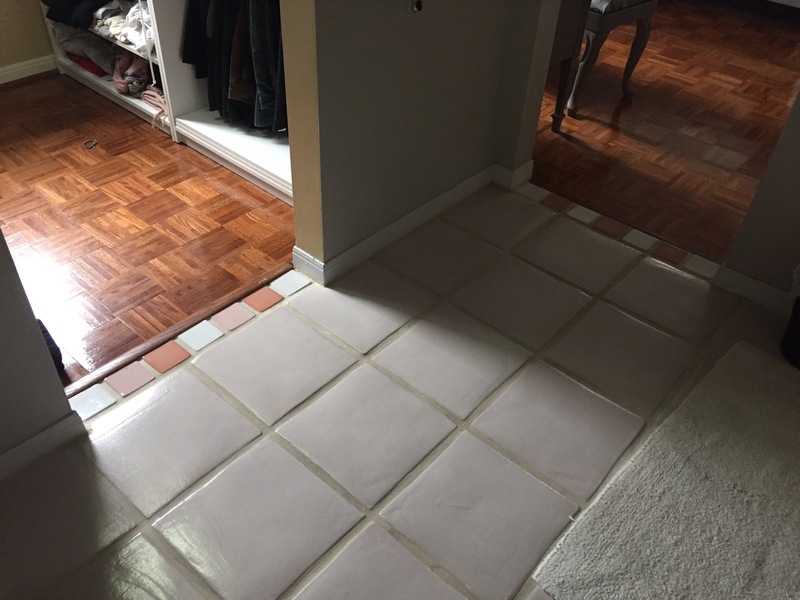 I have always hated these tiles! 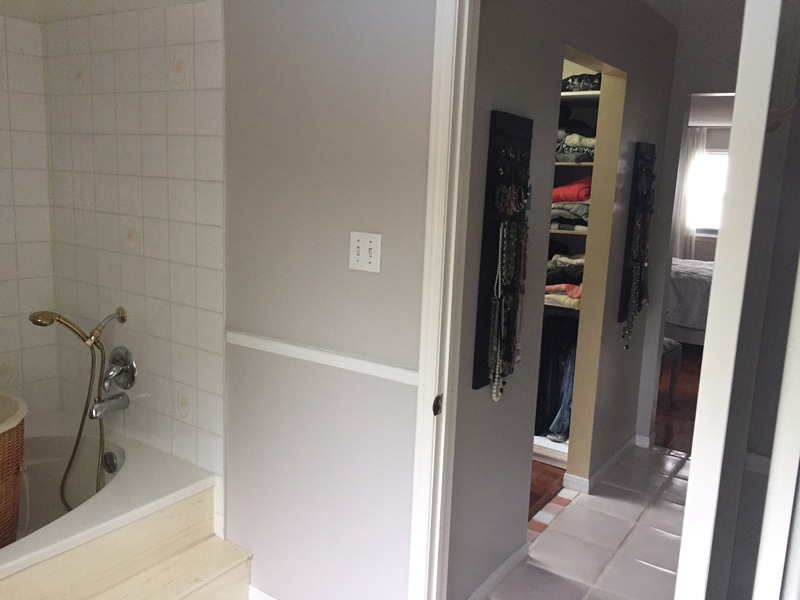 And the worst part of the bathroom was the tiny shower wedged behind the door. What a dumb design! 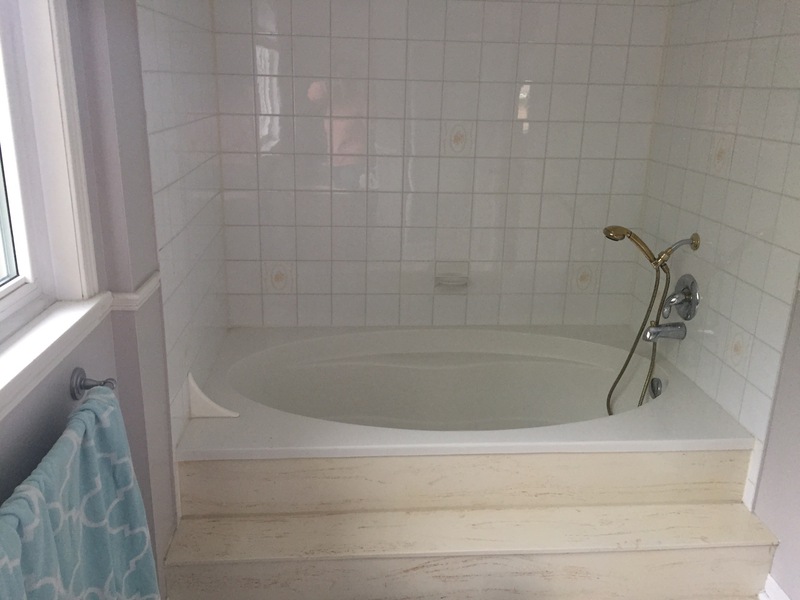 There is so much room in our master bed and bath, this shower design was so horrible. 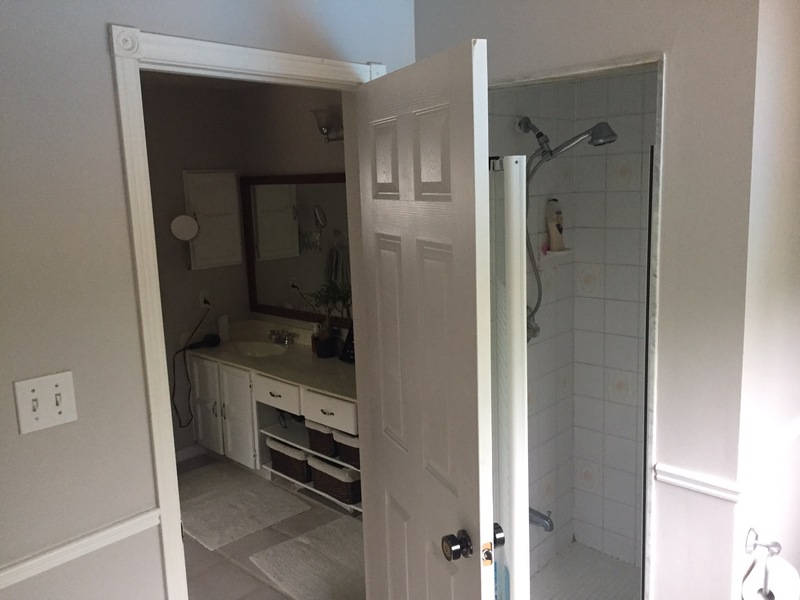 You could not open the door and shower door at the same time. It was also impossible to clean, and was leaking at the bottom. 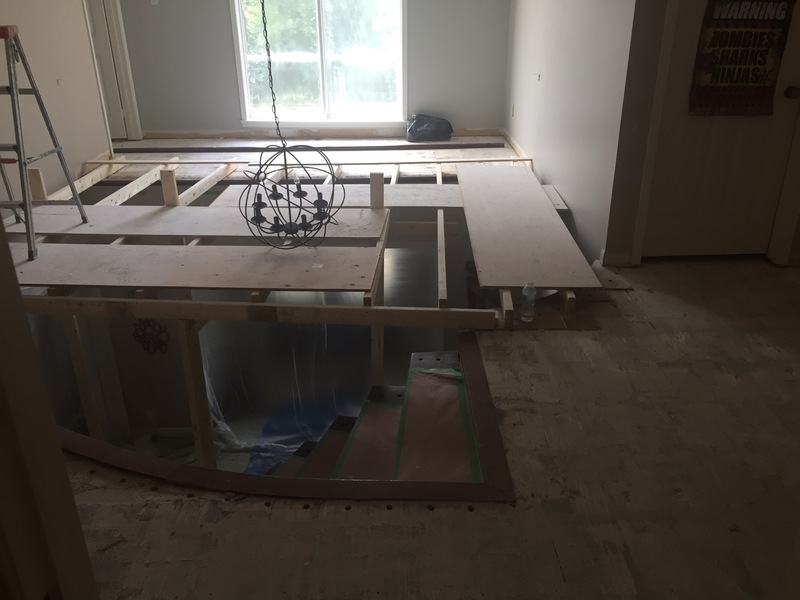 So to appreciate the final product before I share, here are a couple pictures of during the renovation. 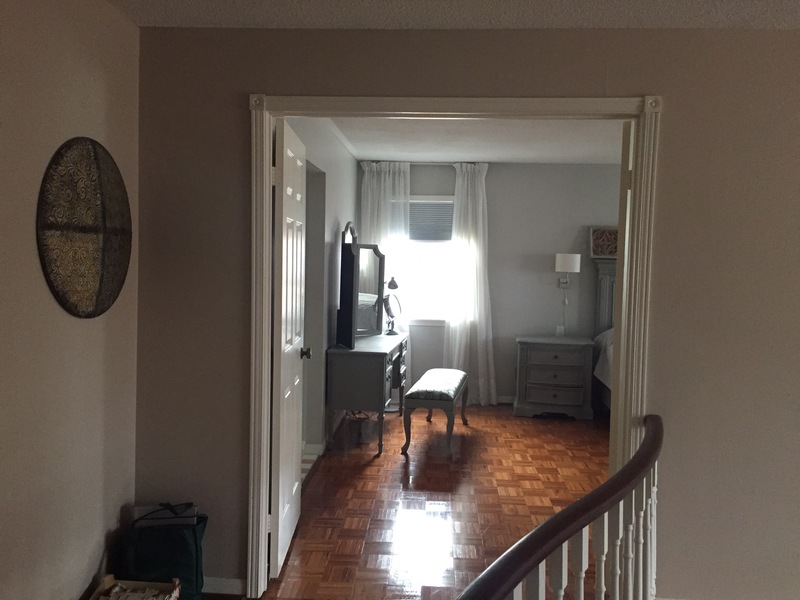 Here is a view of the hallway. 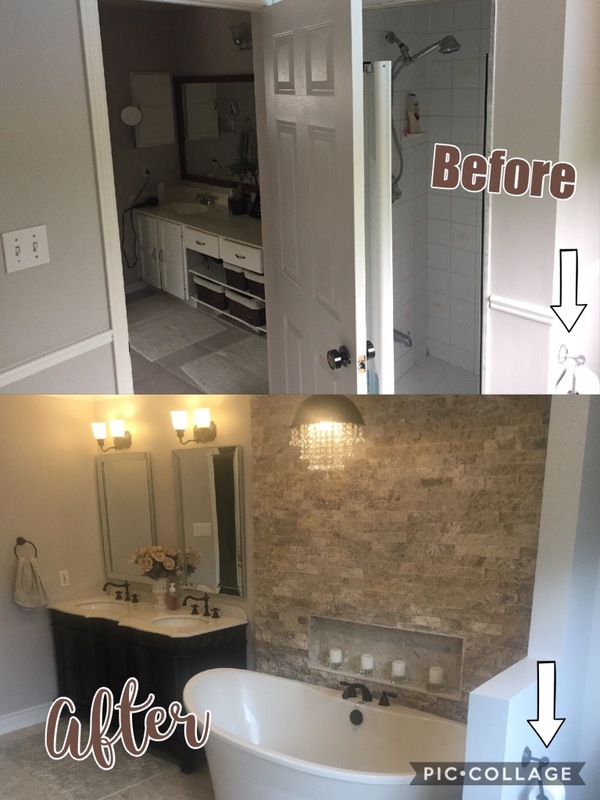 They had to build scaffolding because we had all of the stucco removed, the ceilings painted and replaced the chandelier too. 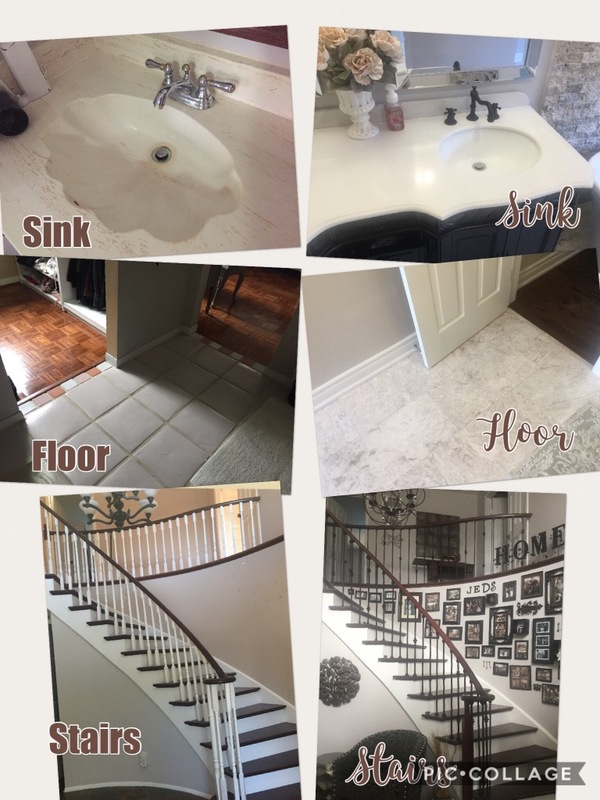 We also replaced the entire floor upstairs with hardwood, and replaced all of the wooden spindles with iron, and replaced all of the baseboards upstairs. We moved a lot of furniture! 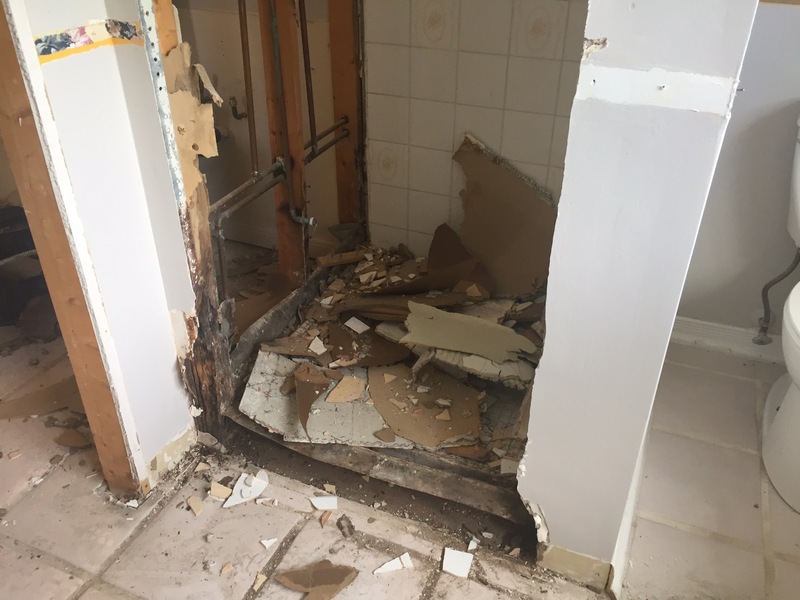 And here is a shot of the shower being ripped out. Yay! Sooo glad to see that gone! You can’t see in these photos, but we also closed off the closet, and made the door open into the bedroom. 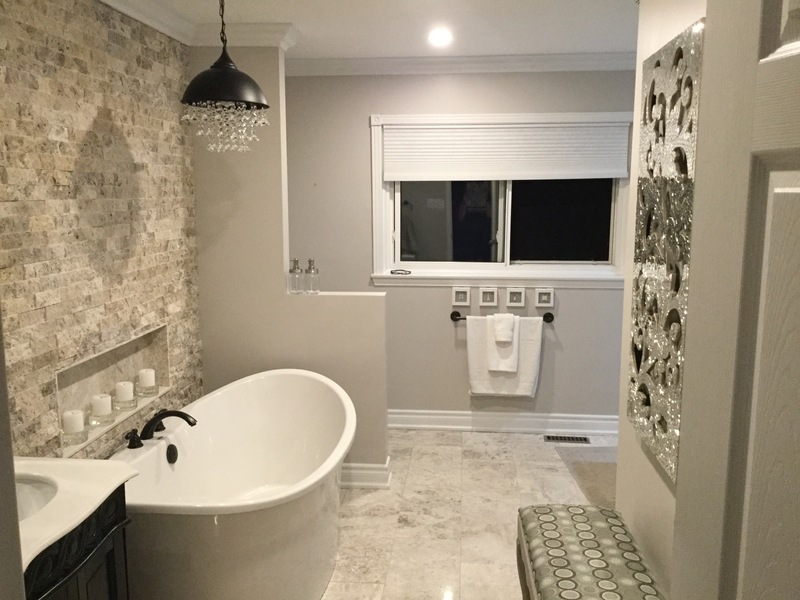 I ordered almost everything including the bathtub, vanity, fixtures, lights online. I spent hours trying to find the best deal in the style I wanted. The only thing I really thought I needed to see before buying, was the tile. We ended up buying solid marble, but we saved a bit of money by buying it from a tile warehouse. Also, to save some money, I installed the rock wall behind the bath tub, laid the tiles on the floor and we did all of the painting. And here is my favourite part, the shower… also the hardest part to photograph! I did a lot of reading about showers, and shower systems, and I ended up ordering one that you install as one piece. I ended up getting a fantastic deal on amazon. 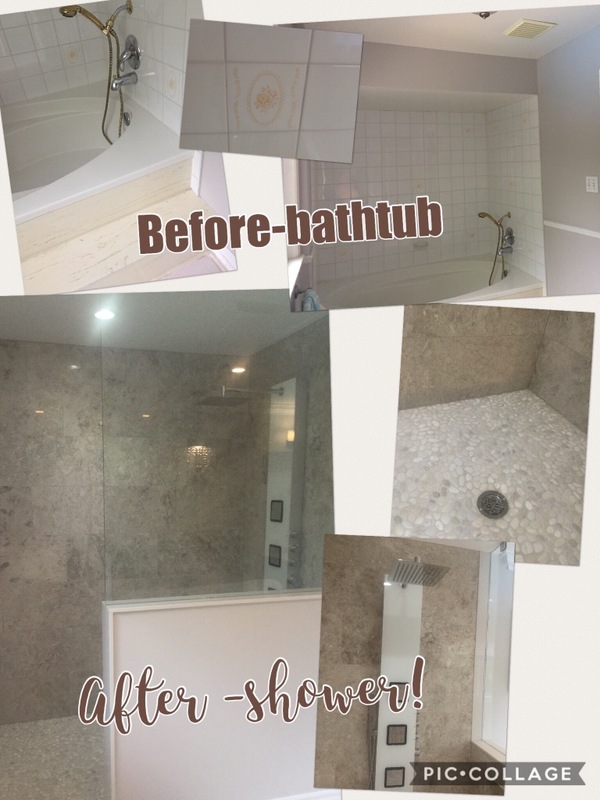 It is a thermostatic (which means you don’t have to play around with the temperature, you can set it ahead of time, then just turn on and off) the pressure is also regulated enough so you can have the rain shower, body jets, and shower head attachment all on at the same time! I can attest the bathroom is gorgeous. Well done my friend. I can’t wait to have some private time in there LOL!!! Aunt Isabel, Tom and I love your bathroom. Well done.